There are a lot of powerful options out there. Some are meant specifically for the well-versed in WordPress. But it’s always my goal at iteachblogging.com to find the best options for the novice, or for those who really want to make blogging less of a HASSLE. Because it is sometimes, isn’t it? It’s work, it’s an effort, some days you’re doing more IT helpdesk than writing or reaching out to potential advertisers. Or you’re set on the idea of blogging but keep hearing horror stories of abandoned blogs. I’m not just telling you this will make your blogging life so much easier, I’m proving it. I’ve used all kinds of perfectly fine products and services in my business. But my goal has always been to find the BEST way to develop a blog, and best means fast, simple and with an attractive, professional appearance. Thrive Theme, Thrive Leads and Thrive Content Builder come together to create a rockstar triad of tools that will make your life so easy it will blow your mind. It helps your blog attract readers, sponsors and advertisers… then keep them coming back. You get back to writing the content that makes you an authority, and that’s time-consuming enough, right? New bloggers, or those who haven’t yet begun, are worried about exorbitant costs (rightfully so). I will tell you up front that none of what I’m about to share is free. If this is what you need, save your time (and money, and potential for so much more) and find a blogspot option. 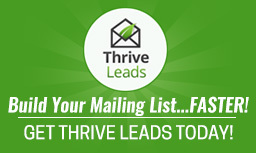 But I can install Thrive Theme, Thrive Leads and show you the freaking MAGIC of Thrive Content Builder for under $440. If you’re just familiar enough with WordPress so that you’ve nearly abandoned your site in frustration, this is the way to spend a little and get a lot in return: Professional online presence without spending thousands on an agency-built site. What you see is what you get, and the mystery of “code” is virtually nonexistent. There’s a lot included in Thrive, but I really want to show you what makes this outstanding. I could just install Thrive Theme for you, but YOUR blogging success is MY blogging success, and I want you to see this adventure through. WordPress can be VERY difficult to learn and maintain, and if you’re familiar with that frustrating, long learning curve, Thrive Content Builder is about to rock your world. Ready to blog but you’re worried that you’ll never be able to learn and maintain it all? Just starting out with your own hosting & domain name but struggling with a WordPress install? A new blogger who realizes you are developing a following and want to take your blog presence from a free option (like blogspot) to your own domain? A blogger who has been at this for a while but you’d really love to have an updated, mobile-responsive blog, save time, and/or get your formatting done faster? An experienced blogger who really wants a change in blog appearance, or you are at a point where you need to pass the formatting to an assistant and want to make that as smooth as possible? Someone at any level or any desire who wants to use a tool that is truly a game-changer for the average blogger who wants it all: content uploaded and formatted faster, a simple WYSIWYG editor console and a design that will make it look like you hired the best in the biz. Turns out, that’s YOU. In a nutshell, I use Thrive for my blogs. You won’t believe how empowered you’ll feel when you realize this tool is for real, and you can actually do this. YOU, the WordPress newbie or WordPress divorcee’, is about to make blog magic happen. Guaranteed. Because part of the $435.40 fee is ME installing Thrive FOR YOU, you can take this off your mental plate. Sit back and relax. It’s easy for me, and takes me no time at all. You’re welcome! You get to choose one of 10 Thrive themes. I show you the menu, you decide. Video tutorials so you get the latest info on the Thrive editor console *see below for info on signing up for a monthly Skype screen-share call with me. We also have a brief form for you to fill out so that you can provide us with the necessary logins, URLs and decision points. We don’t create content for you, and neither does Thrive. In my years of experience building blogs and websites for clients, this has been the dealbreaker for a lot of new bloggers. The excitement of development and design wears off. Sudden realization that the great writing, pretty pictures, videos, graphs or anything else has to come from your wellspring of creativity, is, fortunately or unfortunately, all on you. To help with expectations, we let you know this is often the hardest part: creating content. All the finest tools in the world won’t help you until and unless you create the stuff that fills in the blank. This is the number one reason why blogs are abandoned; number two is the learning curve required with knowing enough WordPress to make it look decent. I’m ready; are you ready? Next steps are to email that you are interested. I will email you back some instructions on what you need to do and what you need to buy. We will walk thru this together. You will not be alone in this setup process.